Originally, this was posted at the Sewing Rabbit. Today, I’m going a different direction than I usually do. No sewing today! Nope, not a stitch. 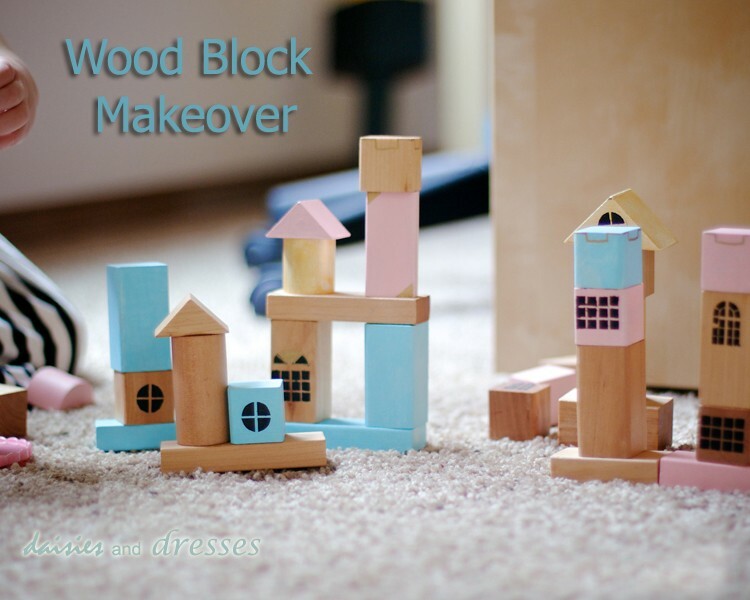 Instead, you and your little one get to makeover that bin of wood blocks that never get played with. You know you have them. I know your secret. 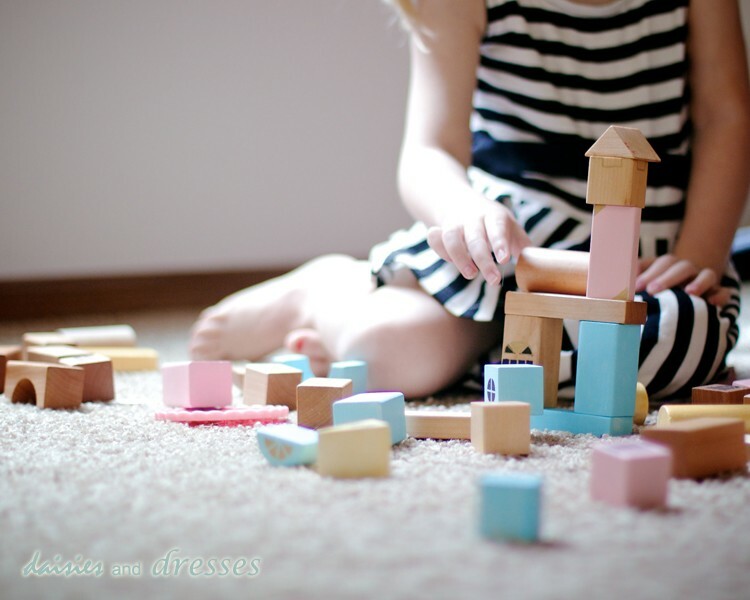 You bought those blocks because every kid NEEDS a set, right? You probably bought them before the your kids could walk. They loved them at first, but over the years, they’ve been overlooked for other toys. Yes, it’s happened to me too. So, today, we’ll make them new again! 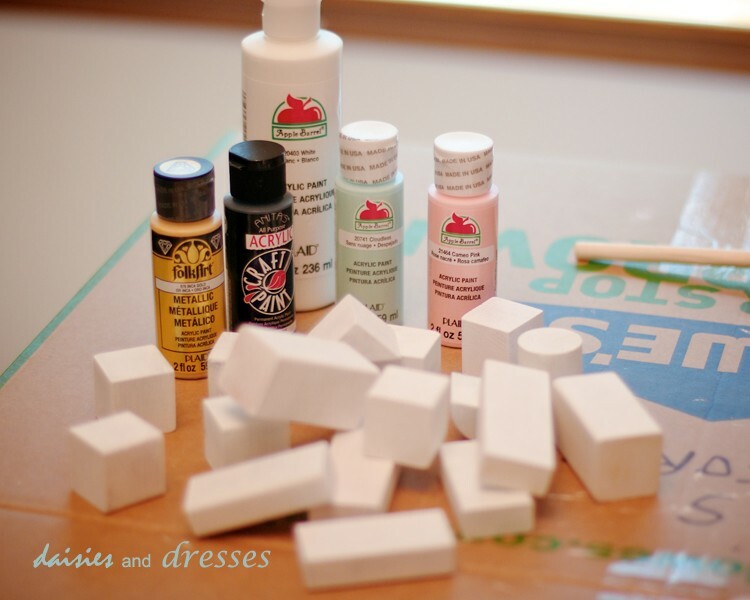 If you don’t happen to have an old bin of blocks, there are some inexpensive sets that you can find for about $20. I bought this set at Walmart about 4 years ago but they still have a similar set online here. Other options are here and here. These are small blocks, so be prepared. It’s a simple project, but it’s not a fast one. 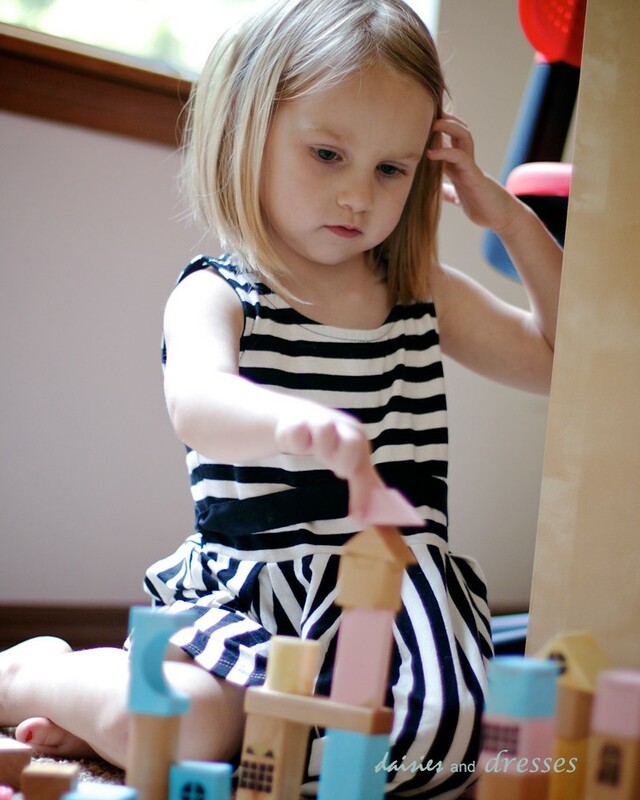 Little Miss and I decided that we wanted the blocks different colors than the original. She picked the colors out. Blue, Pink and Gold. Now they match her room! So, here’s what you’ll need for the blocks. You don’t have to make the wood polish if you don’t want to and can seal them with something else in your stash but I like that the wood polish is non toxic and okay for small people to put in their mouths. 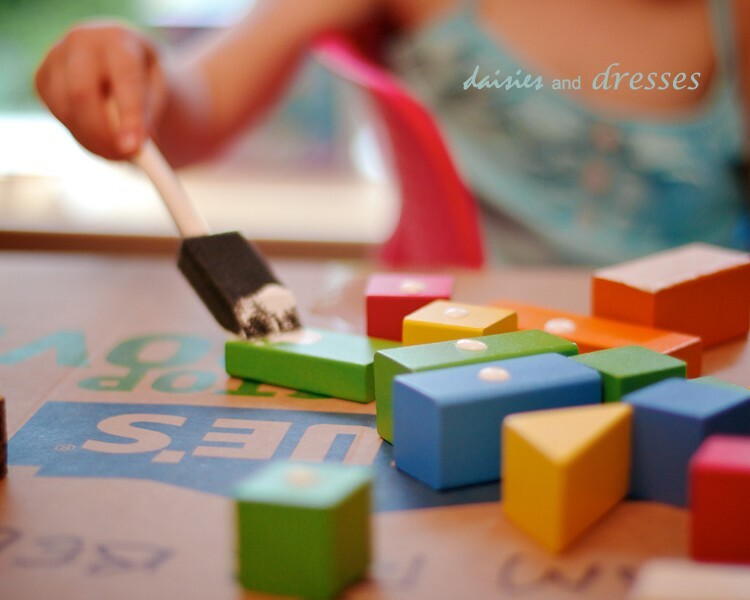 To start off, we gathered all the painted blocks because we anted them different colors. Then we painted them using our white acrylic paint. You want to paint them white first or the colors will show through your paint. We had to put on two coats of white primer. You’ll want to let it dry in between coats. How long this takes will depend on a lot of factors but you can assume it’s at least 15 minutes. You’ll know it’s dry when it’s no longer wet or cool to the touch. Look at all those pretty white pieces! Now you’re ready to paint them in your chosen colors. The black is for the windows and doors. You’ll probably want two coats of paint again so put on some good music. Now, get painting! 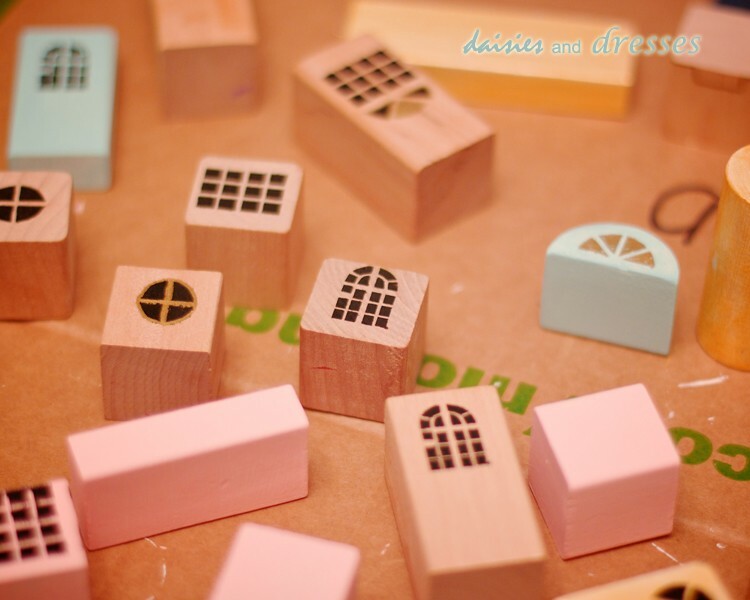 Once your blocks are dry, you’re ready to stencil. I used my Silhouette to cut the stencils out of contact paper but you can use an exacto knife. 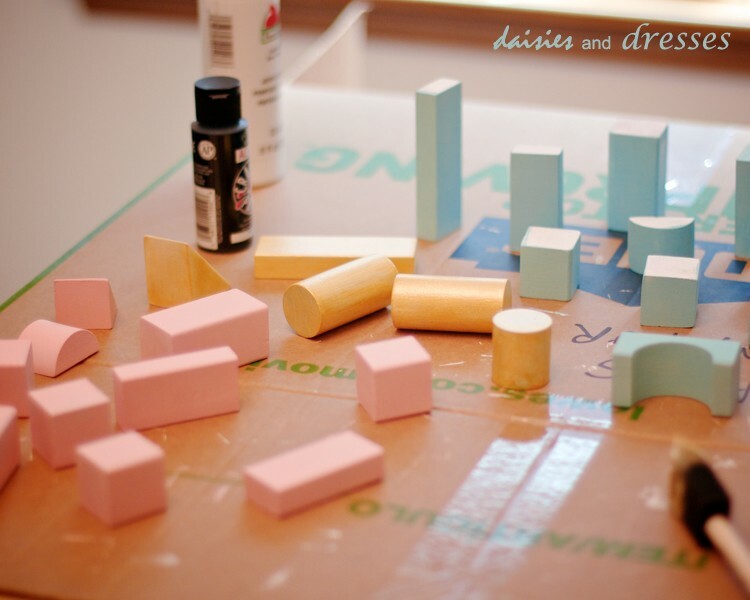 The contact paper sticks to the blocks well and you should be able to reuse it through the rest of the project. Here are the shapes I used. 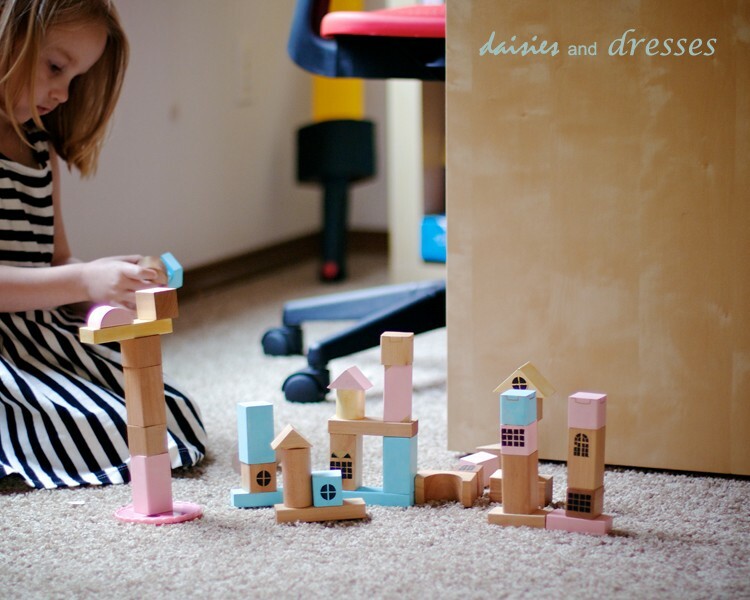 You’ll want to resize them to fit your blocks. After we were done stenciling, I added some embellishments with a gold paint pen. 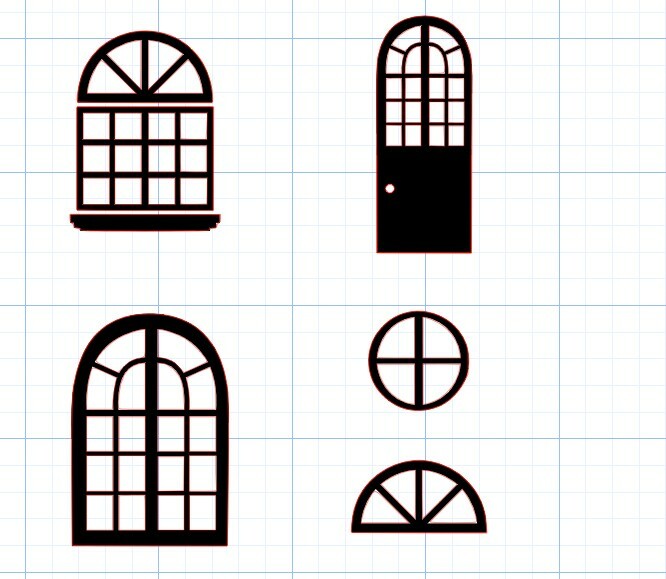 I outlined some windows, added castle turrets and even made some gold windows. Have fun. Just like with sewing, it’s the embellishments that really make a project unique. You could even add window boxes, flowers or paint the a dotted line down the middle to make them look like a street. The wood polish is super simple. You just need two ingredients. Mineral oil (any other oil will work but mineral oil is clear and won’t go rancid) and beeswax. I got my beeswax from hobby lobby but there are tons of people that sell it on etsy. The mineral oil is found at the grocery store, usually near the stomach medicine. Measure 1 cup of mineral oil into your measuring cup. Add grated beeswax until your total reaches a 1.25 cups. So, that’s 1/4 cup of beeswax. Take your cup to the microwave and heat it up. It took me 3.5 minutes but all microwaves are different. You’ll want to do this in 1 minute increments until you see the wax melting and then start with 30 second bursts. 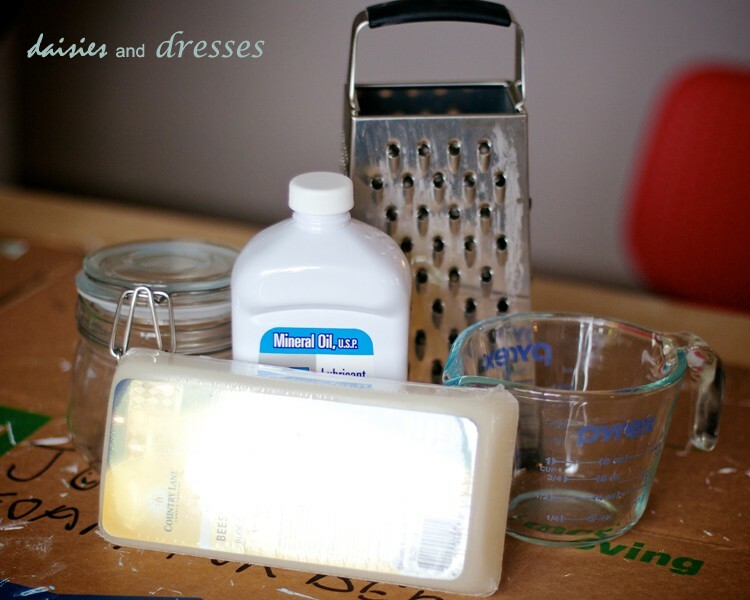 When the wax melts, it will look like a cup of mineral oil. No particulate will be left. Be very careful taking this out of the microwave, it will be incredibly hot. Beeswax melts at around 150 degrees Farenheit, so make sure you use pot holders. Pour your mixture into a container. I recommend a glass container with a mouth wide enough to provide easy access. Now, wait for your mixture to cool. You’ll want to stir it on occasion to make sure it doesn’t separate. If you don’t, you’ll end up with wax on the outside and liquid on the inside. There’s no real science to the stirring, I had to stir mine about 4 times before it was cool enough to work with. Now that it’s cool enough to touch, you’ll notice it’s about the consistency of lumpy butter. Put a dab on your finger and work it into the wood. The wood blocks will darken as they soak up the oil. The painted blocks won’t soak up as much. 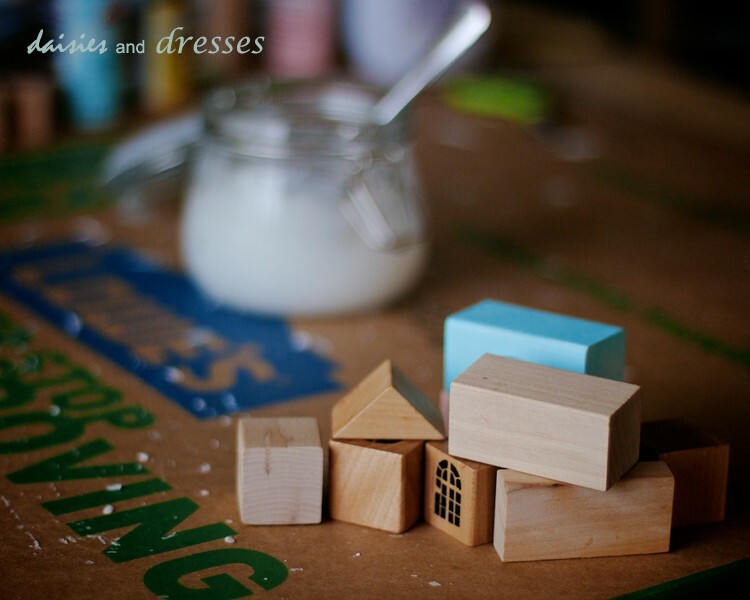 Keep rubbing the blocks until you have an even coat and then use a napkin or an old cloth to wipe off the excess. Here are some treated blocks and some untreated blocks. The darker blocks have been polished. 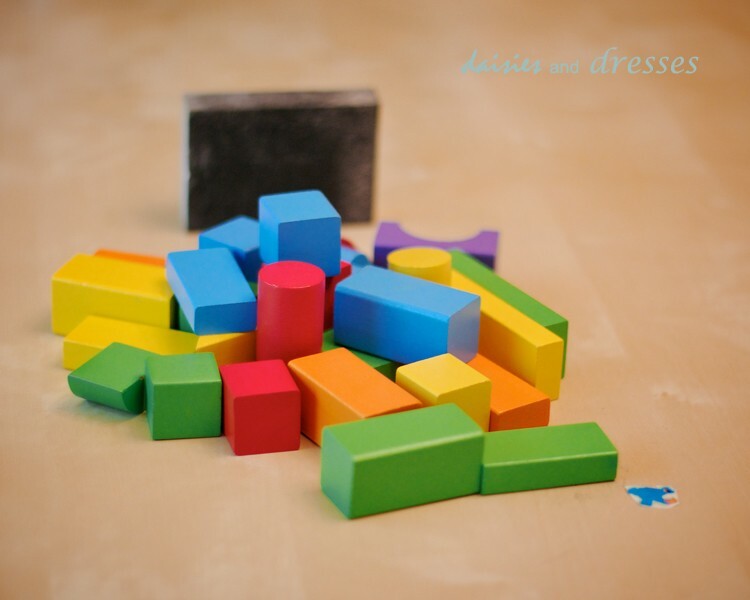 The blocks are ready to play with as soon as you wipe them up. They shouldn’t feel oily. If they do, just give them another wipe. Now, watch your unloved blocks get played with for hours. I wouldn’t be surprised if this becomes her new favorite toy…for now.